HMS Hermes. Image courtesy George Grantham Bain collection. HMS Hermes is torpedoed by the German submarine U-27 in the Straits of Dover. She sinks and 22 of her crewman perish. The Battle of Gheluvelt ends. 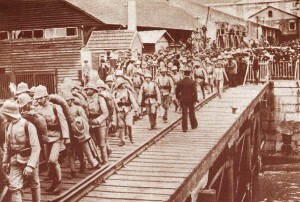 Gheluvelt is lost and recaptured; the British line is broken and restored. The British cruiser HMS Chatham discovers the German light cruiser Konigsberg in the Rufiji River delta in German East Africa. 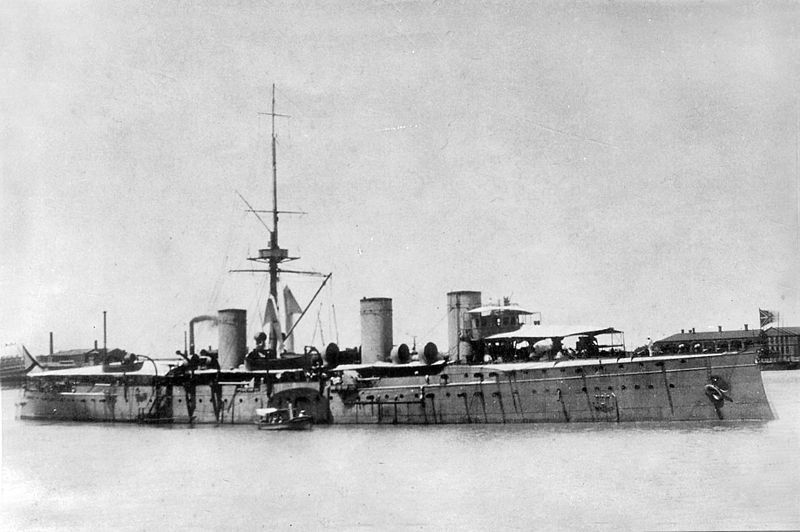 Reputedly the most powerful German ship in the Indian Ocean at the time the Konigsberg was waiting for machinery damages to be repaired. British ships blockade the Konigsberg. 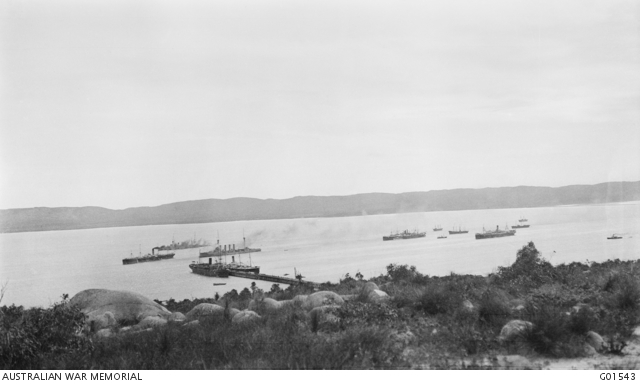 Transport ships coaling and watering in the inner harbour, Albany 30 October 1914. 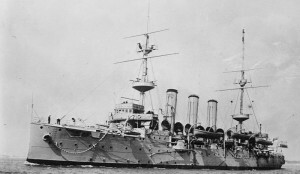 HMS Minotaur and HMAS Melbourne are opposite the pier. Photographer Charles Edwin Woodrow (CEW) Bean. Image courtesy Australian War Memorial. Vessels of the first Australian convoy gather in Albany Western Australia, where they refuel and prepare to set sail for the continent. The British hospital ship Rohilla runs aground in Saltwick Bay near Whitby in Yorkshire. A huge rescue operation begins; 146 of the 220 people on board are saved, including a survivor of the Titanic. The Italian Cabinet resigns and a new cabinet is formed; Antonio Salandra remains Prime Minister. Caricature of Prince Louis of Battenberg, Vanity Fair, 16 February 1905. Image in public domain. The War Precautions Act is passed in Australia. The Federal Government now has the power to impose censorship, restrict aliens, fix prices and take other measures deemed necessary. Turkey commences hostilities against Russia; Turkish warships bombard Odessa, Sevastopol, and Theodosia. Trench warfare starts to dominate the Western Front. An intricate network of trenches would come to stretch 450 miles from the Belgian coast to the Swiss border. 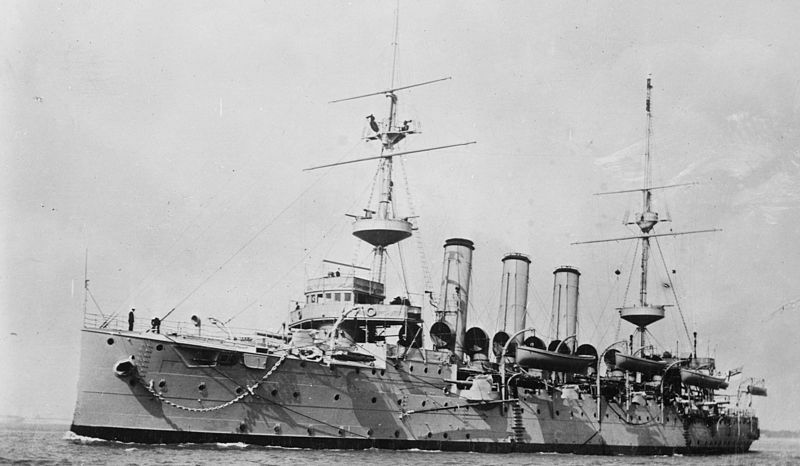 Russian cruiser Zhemchug. Image in public domain. The German cruiser Emden sinks the Russian cruiser Zhemchug in Penang. The Emden arrives at Penang disguised as a British warship, proceeds to raise the German naval flag, sink the French destroyer Mousquet and torpedo the Zhemchug at point-blank range. A second torpedo breaks the vessel in two, killing 89 crewmen and wounding 143 others. 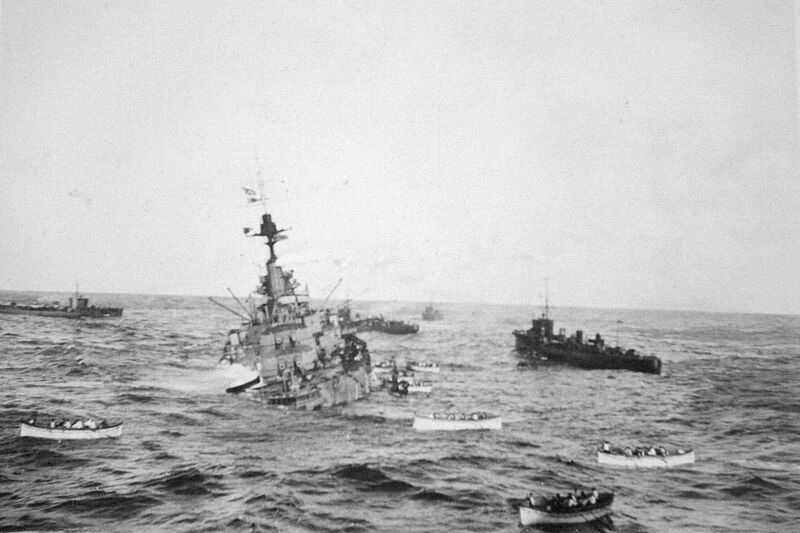 The crew of HMS Audacious take to lifeboats 27 October 1914. Image courtesy Nigel Aspdin. 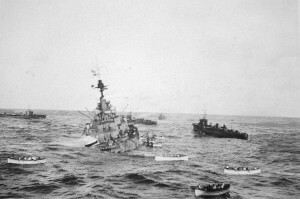 The British battleship HMS Audacious is sunk by a German mine off the northern coast of Donegal, Ireland. In July 2010 a team of divers filmed the wreckage, which lies in 60 metres of water. Caricature of Major-General Sir James Murray by Leslie Ward, published in Vanity Fair, 4 May 1905. Image in public domain. 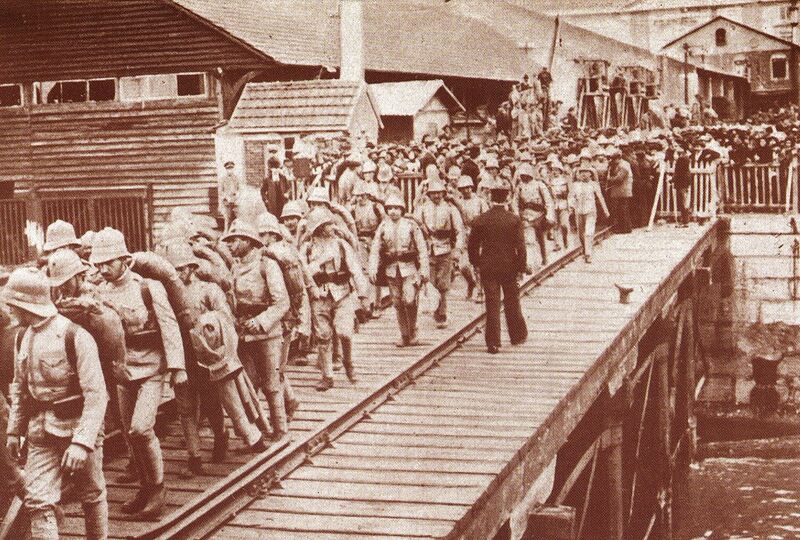 Portuguese troops embark for Angola. Image in public domain. 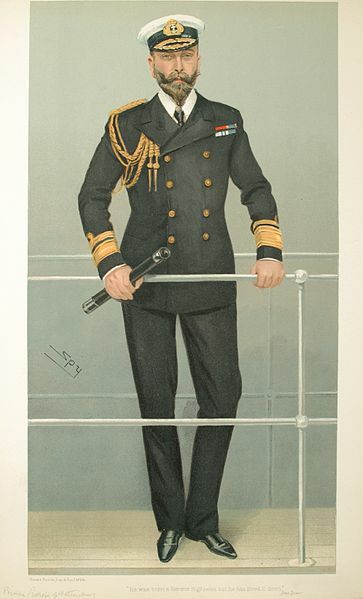 Sir Charles Douglas 1913. 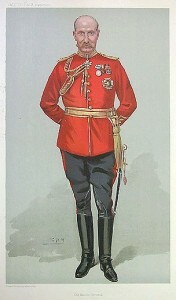 Image courtesy British Government. 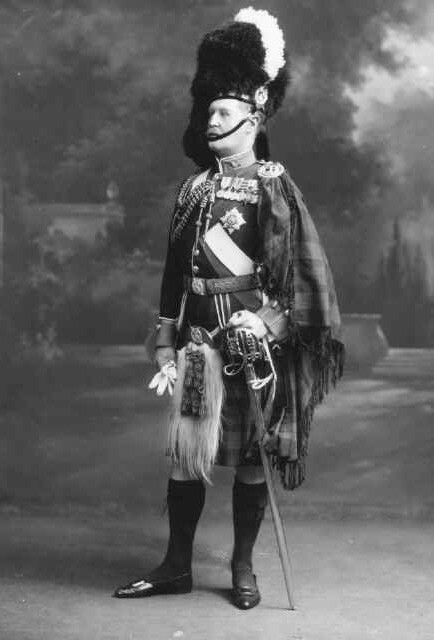 General Sir Charles Whittingham Horsley Douglas, Chief of the Imperial General Staff, Great Britain, dies. Appointed in April 1914, Douglas had been suffering from ill-health for several weeks previously. The Battle of Langemarck 1914 ends. Part of the First Battle of Ypres, British and German forces had fought over a four day period.